Lovie Gene Ervin, born June 14, 1938 in Whitehouse, TX. 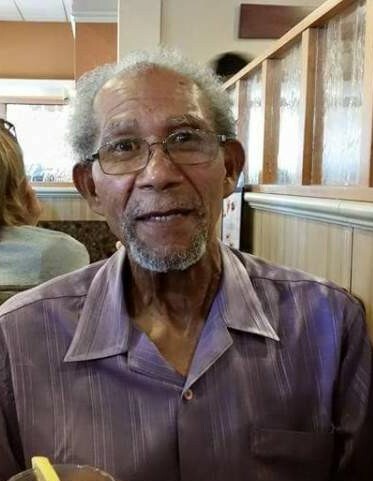 was a member of Ebenezer Baptist Church, a retiree from North Island and San Diego Unified School District. He leaves to cherish his memory his wife, Hazel Ruth Ervin; two daughters, Natalie Ervin Price and Shauna Ervin; grandchildren, Antwone Wade, Kendall Ervin Wade and Kiendra White. The life’s journey of Lovie Gene Ervin began June 14, 1938 in Whitehouse, TX. The only child born to the union of James and Joyce Ervin, spent his early years growing up in the country. There, he was baptized at an early age. He grew up surrounded by a multitude of cousins and relatives who fortified his childhood with love, caring nurture and just plain old fun. At the age of 14, he was relocated with a now divorced Joyce to San Diego, CA where he met his soon to be step-father, Raymond Lott. They had a close bond that was to continue for the rest of their lives. He attended San Diego High School where he met Hazel Ruth Johnson, a recent transplant from Gilmer, TX, located a mere 45 mile from his birthplace of Whitehouse, TX. They both graduated in 1956 and continued their education by attending San Diego City College. They were married April 10, 1960 and shortly thereafter, Gene was drafted to the U.S. Army where he was transferred to Oahu, HI. While there, they welcomed daughter Natalie. They returned to San Diego where Gene settled into a Civil Service position at Naval Air Station North Island. There, the quiet laid back, but very smart young man flourished to eventually being an integral part in the Aeronautics division of several of the Navy’s aircraft carriers, most notably the U.S.S. Ranger. He and Hazel settled in San Diego, purchased a home and welcomed another daughter, Shauna Rene. Gene had an active sport based social life. He played on softball teams, bowled in leagues, played in pool tournaments and became a golf junkie, involving his girls in all. He also was a great photographer, becoming the Johnson Family Photographer for many years. There was hardly a family event where he didn’t have camera in tow. He was the master of nearly everything he tried. He was Mr. Fix-it, he could fix anything! Cars, washers, plumbing, water heaters, lawn mowers, hanging wallpaper and painting, Gene could do it all. After working over thirty years with North Island, he retired and continued working as a bus driver with the San Diego Unified School District for an additional 5 years. It was about this time, Gene became very active in the lives of his grandchildren Kendall and Kiendra picking them up from school, taking them to their activities and most importantly, teaching them to golf! They went to many golf tournaments in Torrey Pines, went to the driving range often, and he even had them taking golf lessons during the summers. He also took pride in caring for Grand Dog, Kash. She was his walking buddy. When he felt up to it, they would spend time at the neighborhood park getting their walk on. Gene also began attending church with Natalie, first at Linda Vista Second Baptist under Pastor Green and lastly at the Ebenezer Missionary Baptist Church under Pastor Moten. Gene was also a great giver. He would give his loved ones anything he had. He may fuss a bit, but it was usually while he was reaching into his pocket and pulling out a wad of cash. He loved his family and took great pride in taking care of all of them. Quiet he may have appeared, but we all knew when he was truly tickled. He had such an infectious laugh that when he got started, all around him would join in. On Tuesday morning, January 29, 2019, God called His child, Lovie Gene Ervin home. He had reached the end of his glorious, winding, beautiful and loved filled journey. He’s done his best, left his footprint on this world and is now resting in the Glory of our Heavenly Father. He leaves behind his devoted wife of 57 years Hazel; daughters, Natalie and Shauna; grandchildren, Kendall, Kiendra (Ryon) and Antwone (Tiffany); great grandchildren, Maliah, Iyanna, Alexus and A.J. ; Grand dog Kash, step-brother, Michael Lott; cherished cousin, Carol Pettigrew of Houston, TX; The Johnson Family of San Diego; The Taylor Family of Whitehouse, TX, and a host of cousins, nieces, nephews, other relatives and friends to celebrate in his homegoing.